Productivity - up to 15 litres per 24 hours. Total capacity - up to 2500 litres. Gross weight - 384 g.
Track membrane filter - HAS NO ANALOGUES! 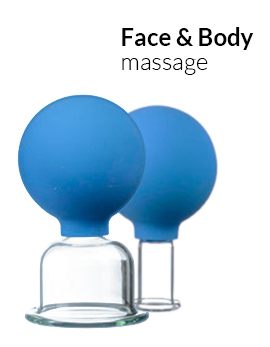 At the present time there are lots of water purification devices. But only "NEROX" uses unique invention of the scientists - track membrane. The filter is capable of cleaning the great number of admixtures, dirt, bacteria and the taste of clean water will be at most approximate to the one of spring water. At the same time the water preserves the microelements that are essential for our organism. The track membrane is made out of thin lavsan film, which has 400 millions holes per square centimeter. Each hole is 0.2 microns in diameter. The hole's sizes allow the vitally essential minerals to get through and be present in purified water, while filtering out all contaminating components, which are dangerous for human health. Mode of purification is taken from nature: every living cell of an animal or plant organism is surrounded by the superfine membrane, which supplies the cell with clean water and necessary microelements. The laminating membrane has been designed and engineered by specialists of Joint-stock company Research and production enterprise "Simpex" on the unique equipment that also was designed inside the Company. The laminating type of membrane has just the same overall filtering efficiency as usual track membrane, 15-20 times exceeding it in durability and strength. The filter is placed into the container with unclean water. Penetrating through the superfine membrane pores the water is purifying and interflowing by tube into the receiving container, which is 0.7-1.5 meters below the initial one. 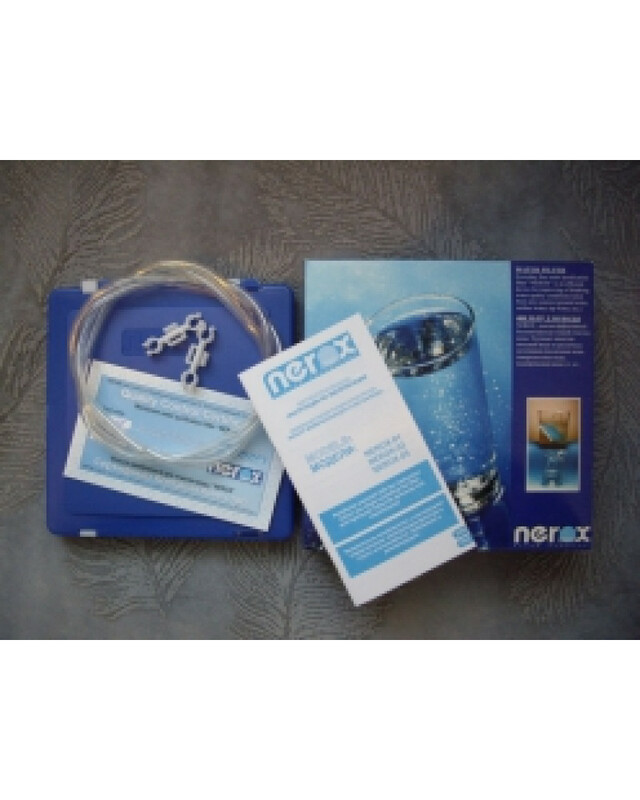 Without replacement of any details filter "NEROX" purifies up to 2.5 tons of tap water. As far as the filter becomes dirty, cleaning with usual flow-through water will be required. Cleaning of the filter is so easy that even a child is capable of doing it. filter element is ecologically clean, i.e. does not contain any sorbents and other chemical elements. Is filtered water good for drinking before a filter starts working in a drip mode and is it necessarily for the filter to start working in a drip mode? From the first second of the "NEROX's" work the water is clean and ready for the consumption. After filtration of 50 - 100 l of water (depends on the quality of the source water ) filter will start working in a drip mode. It is its normal operating mode. Why does "NEROX" suddenly begin to flow (starts to work in jet mode after working in normal drip mode)? If such event occurs after two or three ablutions then probably you have torn the membrane. An attitude to the filter have to be very careful. Most often the membrane is being damaged because of rude handling while the washing procedure. You should wash the filter according to the instruction, do not scratch the membrane, rub it with sponge, touch the membrane with nails, please, wash it only with soft material, do not try to connect the filter to the water - pipe, do not blow in tube, disassemble the filter or make any other experiments like this. Do not subject your family to any extra expenses! Can the filter return to the jet mode after it has been washed? After several primary ablutions the filter can return to the jet mode for some not very long time. How often is it necessary to wash the filter? Filter will help you itself to understand that it is time to wash it because you will feel a lack of purified water. For example, the productivity of clear water becomes no more than 10 l a day. 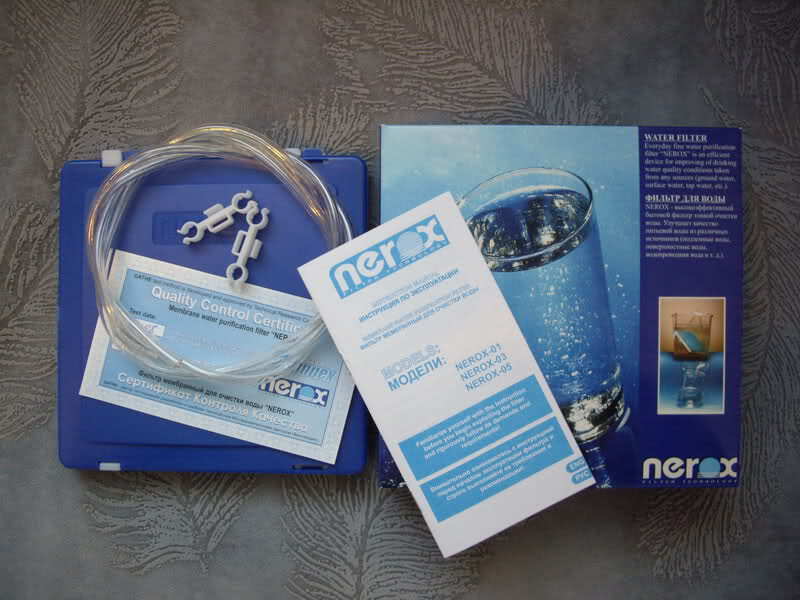 "NEROX" will never give to its user a low - quality, harmful for the health water and will never poison him! This is the principal difference of "NEROX" from sorbent and ion - exchanging cartridges which are everywhere used in household filters and where the strict control of filtered water quantity is required. And what for do the manu- facturers of such products recommend the time constraints for its usage if the useful life is individual in every case and depends on the initial water quality and the quantity of consumable water! What about improvement of the taste properties of the water for the alcoholic drinks production? Unambiguously "NEROX" will improve them. How to check if the membrane is not damaged in domestic conditions? You should take the filter out of the capacity with water, lift it up to the level higher than the confluent end of the tube and look if the water will flow out from the tube. If the water stays in tube or flow out very slowly - everything is OK with your filter. But if the water instantly flows out from the tube - the membrane is damaged. Your filter is out of order. What do you have to do when the filter gradually is getting dirty? When the drip mode becomes too slow, you should open the lids of the filter and wash both membranes according to the instruction. The results of filtering you will see during washing of the filter element. On the membrane surface gather all filtered detrimental impurities which easily are removed after washing with usual water. During the working process of "NEROX" the filtration quality is not getting worse until the complete resource exhaustion and it does not depend on periodicity of the ablution. How to increase the productivity of "NEROX"? You can buy some extra filter elements and with the help of special locks connect them into a block. Can "NEROX" purify a sea water? Will we get a sweet water after it? Yes, it can purify a sea water but can not make it sweet. Although partly the desalination effect is present. But for such goals are used other systems, for example with reverse osmose technology. If it is possible to filter herbs tinctures and use it in phytotherapy? It is not only possible, it is very useful. But you should filter the initial water for herbs tinctures preparation, not the ready tinctures. What temperature of filtering water is permissible? Is it possible to filter boiling water? Does "NEROX" remove an active chlorine from the water and why is the smell of chlorine felt in the water after filtration? The purification efficiency of water from chlorine is not 100 %. However as a rule the filtered water stays in nonhermetic capacity. After two hours the rest of the chlorine will evaporate. Why is the tube little by little being colored in pink or in green color? The tube is being colored in pink color because of the influence of hydrogen sulphide. The purification efficiency from hydrogen sulphide is 90%, the rest 10% of it can cause such reaction A photosynthesis is an everywhere penetrating process. To avoid it eliminate the influence of direct sun rays on the capacities with water and filter. Is it permissible to glue the surface of the membrane by scotch tape if it has been torn? The drip mode of the filter can be saved even if the pores size will be much bigger. But you have to understand that the filtration quality in such case will be much lower. You could not know for sure how tightly the scotch tape closes the hole. Moreover it is unlikely that the glue chemical composition and the base of the scotch tape are suitable or the food purposes. All in all, we are not responsible for such experiments! Is it true that "NEROX" is delivered abroad? Up to 80% of the enterprise's production is exported. The constant consumer countries are Norway, Finland, Singapore, Slovakia, Israel, Russia, etc. The filters are delivered to the areas of acts of God and man-caused disasters via the international and humanitarian organizations - U.N.O, UNICEF, Red Cross and the other. In what way is exercised the quality control of the output goods? You can be absolutely sure in the quality of the goods you buy, because every filter produced here is individually checked on special equipment working on a base of laser counters, after which nobody touch the elements of the filter by hands. Each filter gets its serial number and quality certificate. We would like to recommend you to choose between three models of filters - Nerox 01, 02, 03. Each of the models is packed in one type of package that can be a box or a bag. 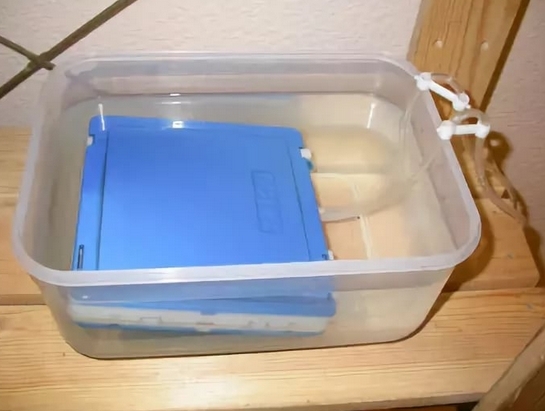 Filters packed in a bag are completed with a filter, a tube, two tubes holders (not provided with additional plastic containers), and two additional plastic containers (2 bags) for the pure and dirty water. Model 03 is the only one completed with a replaceable filtering element. You can buy it separately and if necessary replace the old filtering element with a new one. Model 03 is the only one that can be united in blocks of several filters, that can considerably increase its efficiency. Bodies of the model 03 filters are tightened against each other (on the principle of construction kits). You can assemble by your own a filter of any productivity.